Legacy 2030 | Winston-Salem/Forsyth County Planning Board: The Big Question: Where will 120,000 People Go? The Big Question: Where will 120,000 People Go? Forsyth County is expected to see a net increase of 120,000 new residents and 66,000 new jobs move to our communities. Where will these new residents live and work and how will we preserve the good qualities of our county while accommodating necessary new development? How will we preserve prime acreage for employment centers that are currently undeveloped but are zoned for single-family development? What is the most economical way for our community to develop and receive services in a way that helps keep taxes from increasing? To answer these questions, it is necessary to understand our options for future growth and make a deliberate choice about how our community moves forward. The Growth Management Plan can be an important tool in implementing any chosen growth strategy. Due to the prominence of low-density residential development patterns in recent decades, Forsyth County has only 62,000 acres of undeveloped land left which is capable of supporting urban and suburban growth. 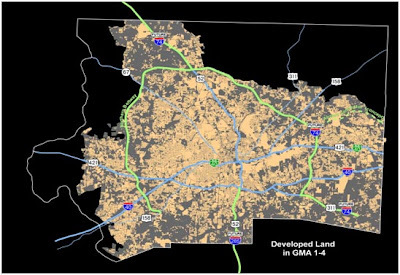 This area of land will be referred to in the Legacy Update as the “Serviceable Land Area.” While 62,000 acres may sound like a lot of land, incorporated Winston-Salem and the surrounding small municipalities could be built-out in 25 years if current development patterns continue. How quickly the remaining 62,000 acres of Serviceable Land Area are developed depends on the availability of the land and the timing and density of the development. The lower the density of any new development, the more quickly our remaining land will be used up. Since 1950, Winston-Salem’s density has dropped dramatically (63%, from 7.3 persons per acre to 2.7 persons per acre) due to suburbanization and smaller household size (the number of persons living in each dwelling unit). The other municipalities in Forsyth County have even lower overall densities ranging from 0.6 persons per acre in Tobaccoville to 2.4 persons per acre in Clemmons.